Everybody knows that there’s no party like a jailbreak party! 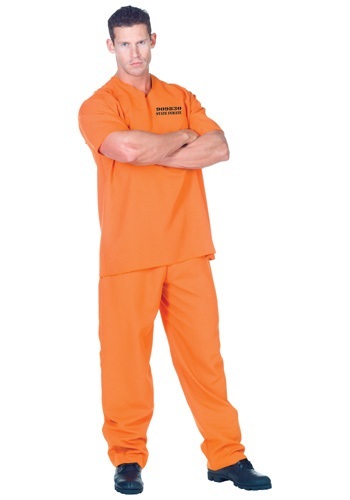 You’ll be ready to fit right in with the rest of the escapees when you’re doing the Macarena in this Public Offender Inmate Costume. Grab a buddy to be your cellmate and the two of you will be ready for the best Halloween bash ever. One thing we know about prison is that in order to survive you need to have plenty of street cred… at least that the way it seems in all those movies and TV shows about prisoners. So make sure you’ve got an awesome background story prepared for the people that ask you how you got locked up. Will you tell them that you’re a world-class jewel thief that finally pushed his luck or will you keep it low-key and say you’re doing time for a world record amount of parking tickets? Either way, make sure you have your story straight… a liar is the last thing you want to be called. Everyone knows if you have an untrustworthy reputation out in the yard, you’ll never get to join in on any inmate games! And we imagine prison becomes extremely boring if you don’t get to join in on the gen-pop festivities. Now if you happen to run into any police officers while running around town in this costume, remaining calm is the first thing you want to remember to do. If you start acting guilty then they may assume that you are in fact a prisoner and return you to the local jailhouse… and that doesn't really sound like the most enjoyable way to spend your Halloween. So remember, calm and respectful!